Hello! Welcome to day 12 of the 12 Gifts of Christmas Blog Hop hosted by the awesome Jennifer of Ellison Lane Quilts. Have you been following along since day 1?? If not, there's a list of links to all the tutorials at the bottom of this post so go check them out! 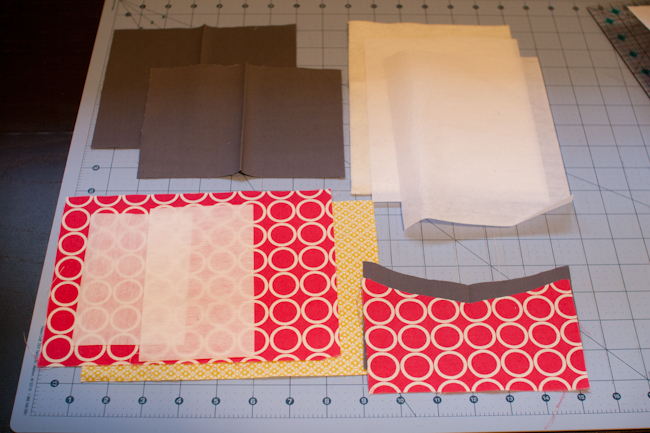 Today, I'll share a quick/easy/scrap busting tutorial with you. I've done a bit of brain storming since Jennifer invited me to participate and I decided on creating a wallet/organizer that can hold stuff like iPhones, jump drives, memory cards, credit cards, business cards, cash, notes, memo pads, etc. . . . great for the person who needs a little organization. You won't need a lot of fabric for these and they sew up quickly. . . perfect for whipping up last minute Christmas gifts! I used two different fusible interfacings for this project but you can easily substitute what you have on hand. 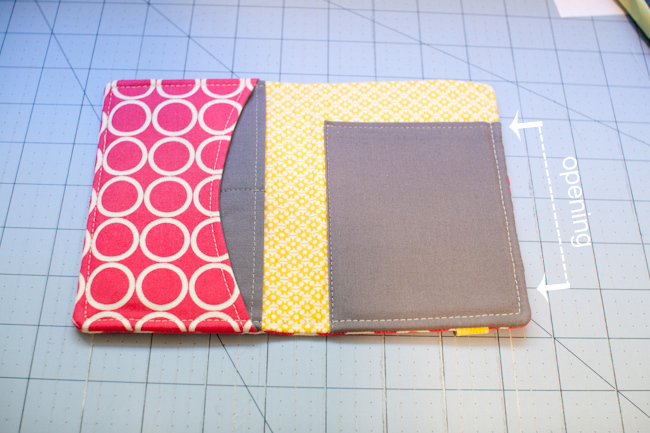 I chose a featherweight interfacing for the pocket pieces to allow a bit of flexibility/ease in the pockets and chose Craft Fuse for the wallet outer/lining pieces to give the wallet more stability. *sorry for the tutorial photos in advance. I got so caught up in the "process" that I didn't put a lot of thought into my photos. I think there are enough to get the point across though, so not all is lost! Oh and please disregard my nasty ironing board. It's well loved. . .
1/4" seam allowance used throughout the project. *I dyed my elastic yellow using this tutorial here! I used Dylon in Sunflower Yellow and Sew-ology Braided Elastic (purchased at Hobby Lobby). Now that you've got all your pieces cut, you'll want to fuse interfacing to the corresponding pieces according to the manufacturer's directions. -center the interfacing in the middle of each fabric piece so that you have an even 1/4" border of fabric around the edge. This will help reduce bulk in the seam allowance. -center interfacing on the fabric piece that will face out once placed onto wallet lining and fuse. 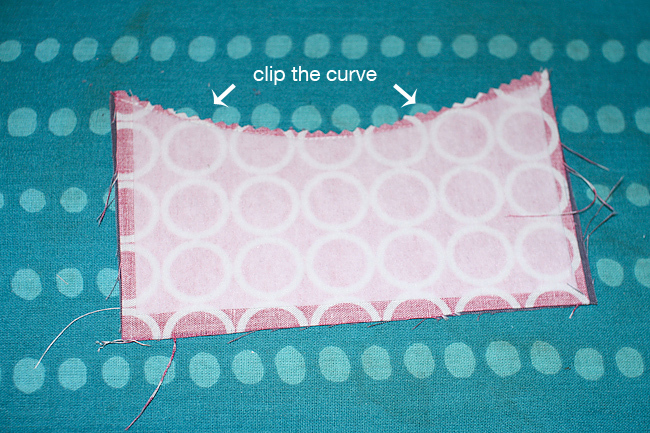 Place both curved pocket pieces together (right sides touching) and sew along the curve. Clip curve and flip fabric over so that wrong sides touch. Press. Topstitch along the curve. 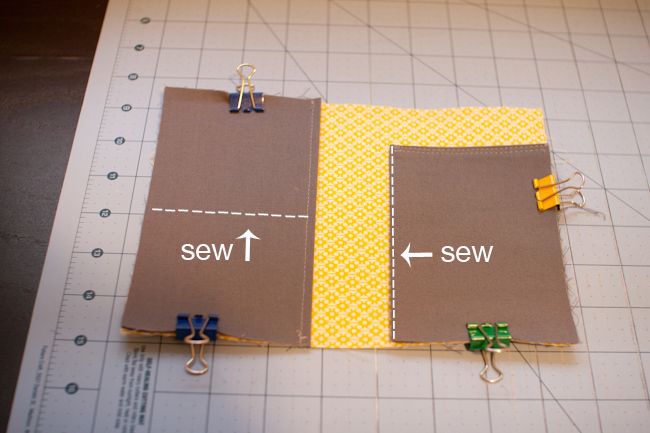 -fold the fabric piece in half width wise and press to create a crease. 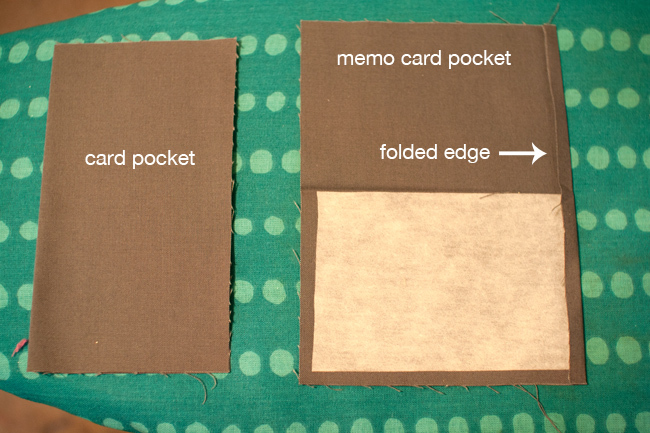 Unfold pocket and place interfacing on one side of the pocket-line up edge with the crease. Fuse. Fold pocket piece again (wrong sides touching) and topstitch along the folded edge. Find the center of the pocket and draw a line down the middle. -fold down the top long edge of the pocket 1/4". Press. Fold pocket piece in half width wise and press. 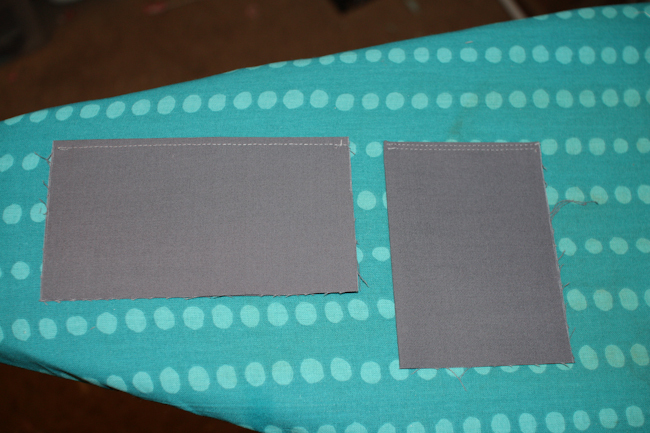 (the 1/4" folded edge will be the top of the pocket). 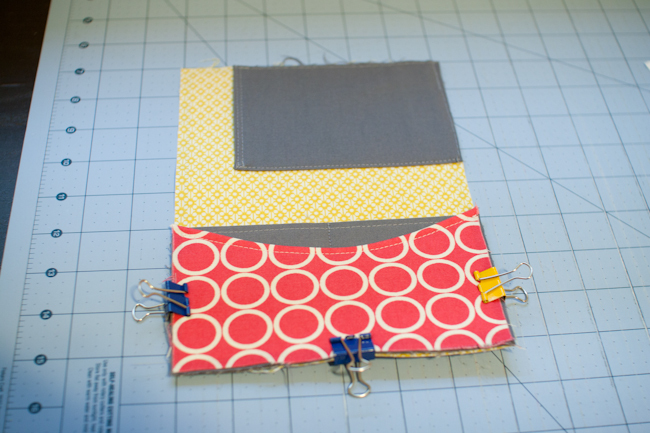 Unfold the pocket piece and place interfacing on the wrong side of fabric. Place the interfacing so that the top edge slides underneath the folded edge of the pocket and so that it lines up with the crease of the pocket. Fuse. Fold pocket in half again and stitch as close to the top edge as possible. See photos below for clarification. Place your lining piece right side up. 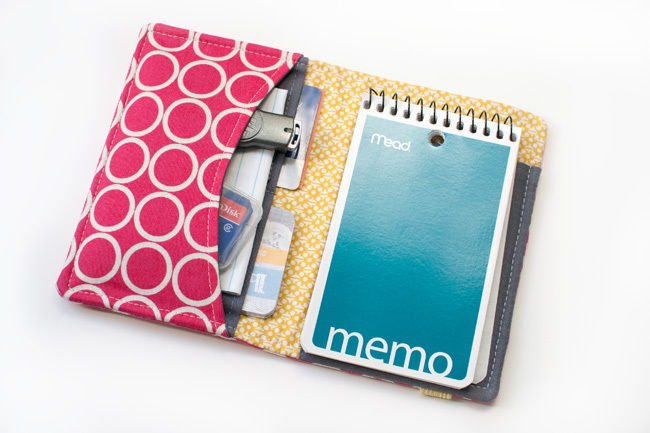 Using the photo above as a guide, place your memo pad pocket on the lining in the bottom right hand corner. The raw edges of the pocket will line up with the right and bottom raw edges of the lining. Pin or clip in place. Sew along the left side of the pocket to the lining, as close to the edge as possible. Make sure to reinforce your stitches at the top of the pocket. Baste around the bottom and right edges of the pocket. Next, place your card pocket on the left hand side of the lining. Pin or clip in place. Stitch along the line you drew earlier to attach the pocket to the lining and divide it. Baste along the other 3 edges. 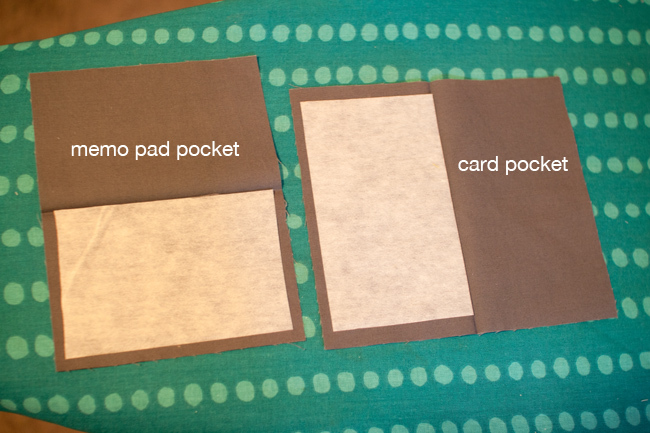 Finally, you'll take your curved pocket and place it on top of the card pocket. Pin or clip in place and baste along the sides and bottom of the pocket. You may find that the pockets stretch a little when being sewn on. If so, flip your lining piece over so that the wrong side is facing up. 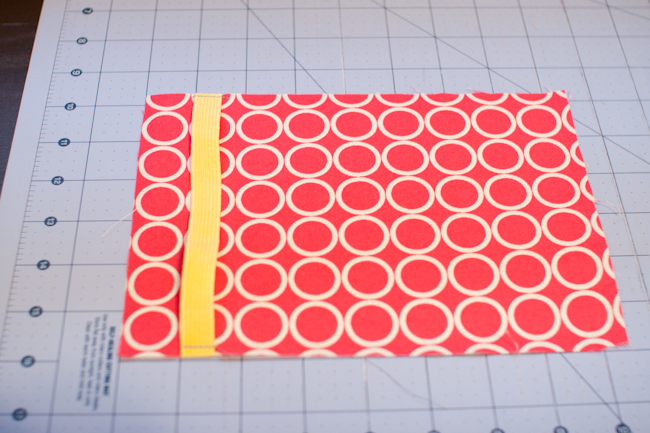 Using your rotary cutter/ruler, trim off excess pocket using the lining piece as your guide. Take your outer wallet piece and place it right side up. If you're using a directional print, make sure it's not upside down. Measure in 1" from the left and make a mark at the top and bottom of the fabric. Place your elastic to the right of the marks. Sew elastic in place making sure to sew within the 1/4" seam allowance. Your elastic is slightly longer than the fabric piece so you'll need to line up the bottom edges of the elastic with the top and bottom edges of your fabric. Clip or pin layers together. If at this point you notice things don't line up perfectly, unpin the pieces and trim any excess using your lining piece as a guide. You don't want to cut anything smaller than your lining. Put your pin/clips back in place and continue below. If you have a walking foot, I highly recommend using it here to keep your layers from shifting. 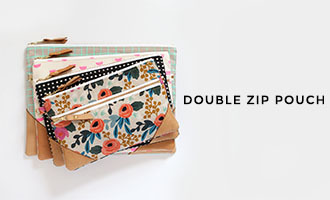 Sew around the wallet. 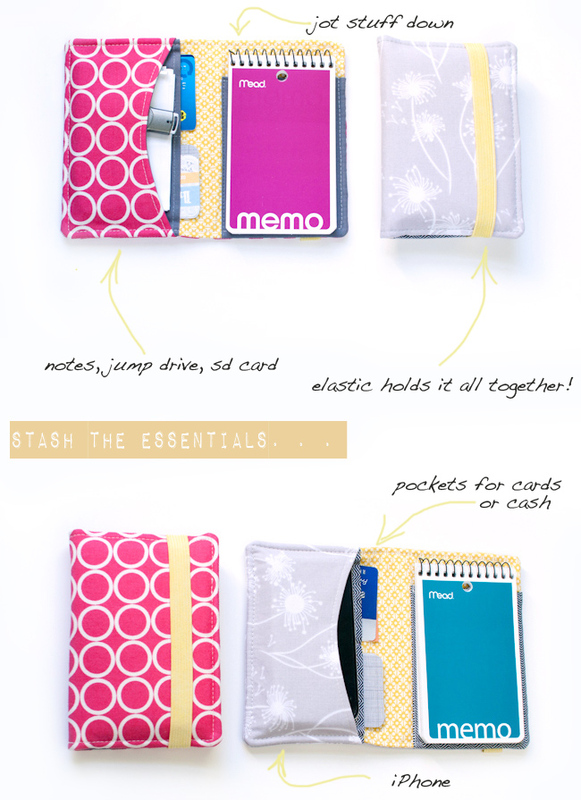 You'll be leaving a 3.5" wide opening to turn the wallet right side out on the side with the memo pad wallet/elastic. Before turning your wallet right side out, clip the 4 corners carefully and trim back the batting to the seam line on all sides except the side with the opening. You may also want to trim the seam allowance down to 1/8" on the edge with the curved pocket/card pocket. Turn right side out and press well. Slip stitch the turning hole and then topstitch close to the edge along all 4 sides of the wallet. 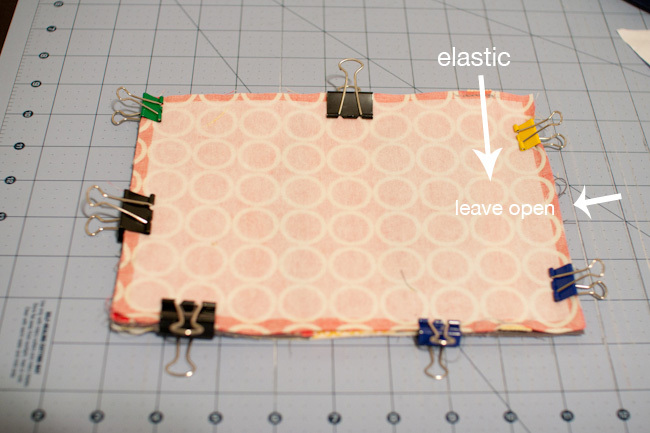 You'll need to move the elastic out of your way while topstitching. . . a little tricky but it can be done. That's it! You're finished. Thanks for stopping by! Hope you've enjoyed the tutorial and don't forget to enter the giveaways below. Also, if you make some of these wallets, feel free to share photos in both my Flickr group and the official blog hop group pool here! Enter to win a $50 gift certificate to Pink Castle Fabrics by leaving one comment on this post. Winner will be chosen via Random.org and announced here on Oct. 27th. Also, please visit Ellison Lane Quilts and leave one comment on her tutorial to be entered to win the GRAND PRIZE of a $250 gift certificate to Fabricworm! And just for stopping by, you can take advantage of a generous 15% off discount at Fabricworm with the coupon code fw12days through the end of the blog hop. This is brilliant! I love love love this and will be making one for myself VERY soon! oups! wish i could win this one.. it looks real good..
Gorgeous, I don't think I've ever seen elastic in pretty shades other than white and black before. Wow, that's cool! Thanks for the tutorial! This is so wonderful. Thank you so much. Gorgeous project, can't wait to make it! I love it! And the first one is for me! Thanks for the tutorial and lovely giveaway. Great tutorial! Looks like it would make a perfect stocking stuffer! Thanks! This is a wonderful handy little wallet! The perfect Christmas gift! Thanks for the tute and the giveaway! Great tutorial - what a good idea! These would be great stocking fillers for Christmas! What a handy tutorial! I'm used to read your posts at Reader, but today I've read it on your blog. You have such a beautiful blog! Wow this is great!! 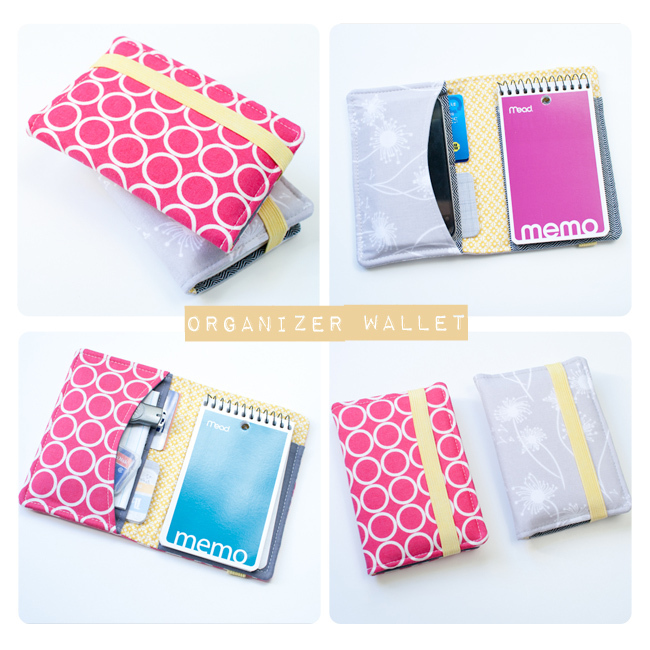 I need to make this organizer, great tutorial. thanks!! This is a great tutorial! It will make great gifts for the whole family! Thanks!! This is just the thing for a gift for myself. And it can even be late for Christmas (so many projects) and I won't mind! I can instantly think of 12 people who I'll make this for for Christmas. Thanks, this is so much better than what I was going to make them! Great gift idea. Thanks for such a wonderful tutorial. love your tutorial, great idea. Please count me in the give away. Thanks for the great tutorial and the fantastic gift idea! I neeeed that organizer! Very great job, thanks! This is just what I need for my purse. In my line of work I am always digging for a piece of paper to jot down a note. It is generally an envelope or gum wrapper or Lord knows what else. Thank you for this tutorial. This is going in the "me" pile. Wow this is great! It would be a great gift! Thanks so much for sharing! That is one handy little wallet. Very clever. Thanks for sharing. This is absolutely fabulous - just what I need to whip up a few presents. Thanks so much. This is great - thanks! I'll be making a couple of these as gifts. Great tutorial - thanks for sharing. Great idea and perfect tutorial! Thank you!! This wallet ROCKS, can't wait to make it - thank you so much for the tutorial. I love this. What a great present. I love this idea and will be making a couple for friends and for me of course. LOVE this idea! What a great tutorial! Great organizer! Thanks for the tutorial:) Enjoying the blog hop, too! This is a great project! I am always looking for awesome little ideas such as this to have on hand for gift making! thanks! What a cool tutorial. Thank you for participating in the hop. Awesome project! Definitely going to make one. Love how you use clips to hold things together. I hate pinning. Very adorable! Perfect gift for all my sorority sisters. Much love. Really good tutorial of a sweet little idea. Well done! and thanks so much for being a part of the fun. This looks super fun to do!! I love your tutorials, they are always so clear and easy! I love the idea of dying the elastic! That is such a great idea! Thanks for sharing the tutorial! Awesome tutorial! Can't wait to try it... and I would love to win one of these!! This is great. I may make one for my mom! Ooooo.... I love this and I know a certain little five year old that would want SEVERAL of them because that is the way he rolls. THANK YOU! I will absolutely be making some of these for gifts! Thank you! A-dorable!!! Love, love love this little wallet. Thank you for a great tute! I am loving this blog hop! So glad to have found your blog and great tute! Such a great tutorial Vanessa. Your sewing is always top notch! Thank you so much for being a part of the blog hop! How cute! I love your fabric choices. 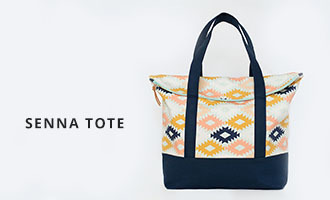 I'm totally making this--my wallet is falling apart! thanks for the tutorial! and chance to win the giveaway! I've made several little card wallets but I'm going to use yours from now on - much better - thanks. This is GREAT! thank you for the tutorial. This is great! This is going on my list for options for teacher gifts this year. Thanks! Thanks Vanessa! What a great little tutorial and perfect for a stocking stuffer! I'll be making a few of these! I LOVE this organizer/wallet. Thanks so much for sharing the tutorial. I really like that and i need a new wallet hmmm. I need one of these! Very nice, thank you. Wonderful tutorial. This will definitely make great gifts. Cool project - thanks for sharing! I like your idea of using pinking shears to clip the curved seam allowance - genius! Thanks for a great tutorial! Bookmarked :) And thanks for the chance to win!! This is such a great tutorial!! I can't wait to make one :) Thank you! This would be the perfect gift for my high school friends at our girls weekend. We get together every five years for a weekend of fun and sharing. Thanks! Oh no! This is number 12 already?! It's a cute little one - thanks! I am SOOO making some of these for Christmas gifts! That Organizer is great! It's just what I need for my little calculator and note pad. Also a great gift idea! Thank you! Very timely tutorial with Christmas just around the corner! Thanks for that and the opportunity to win. Oh~~ I so need this! Thank you for sharing this great tutorial. love it! i make wallets as gifts fairly often, but i love all the little touches in yours... definitely inspiring me to get out of my rut! Great tutorial. Thanks for explaining about interfacing! Most people use but I've never have and don't know the differences between types/brands. Thank you! I needed an idea to make about 10 - 15 duplicate Christmas gifts and THIS IS IT! I will give this a go on some fabric scraps to see if I can make it work! You might be hearing from me with a question or two. I'm more of a 'learn by seeing' not always by 'reading' - even with pictures! And thank you for the fun chance at the giveaway! The best tutorial ever! thank you and I am making some this weekend! What a great tutorial! I'm definitely thinking Christmas gifts. Vanessa, you've outdone yourself! How did you know I needed a fabulous wallet? Oh, I love this tutorial! Thank you for sharing!! Thanks for the tutorial! Such a cute little wallet. Great idea and nice tutorial! Thanks for sharing and the giveaway. i love this project! perfect for making 5 or 10 an keeping one, then giving the rest as gifts! definitely bookmarking! thanks. This is a great tutorial and a wonderful idea. Pretty much everyone could use one of these! :) Thank you! If only I could buy some time to make something like this for me... It's a great idea and also a great giveaway! Wow is all I can say! I'll definitely be making one of these. What great fabrics. Thanks for the tutorial and giveaway. gorgeous!! brilliant!! and I can't wait to make one! thanks so much for the tutorial!! also side note...tried to comment on ellison's blog..unable. to. can't wait to see the rest of the posts!! Can I say that I love it? It looks great, thank you so much for the tutorial. That's actually more useful looking than I thought it would be at first glance. Thanks for sharing and giving us another opportunity! What a great tutorial!! Thank you!! This blog hop has been so much fun!! Definitely making one of these for my brother and a friend for Xmas! Thanks for the great tutorial and the chance to win! Thanks for showing us "how to"
This is great! I so need one of these to keep my life in order! Thanks for the tutorial! I hope to sew up one soon! I love this wallet. It's perfect & easy to sew. Thanks for the giveaway. I have made other wallets and I really like the pockets on this one! Thanks for such a great tutorial. It was very clear! This looks like an amazing tutorial! I think I will definitely be giving it a try. very clever wallet and carefully thought out directions, thanks loads!! very cute! love the curved pocket. Congrats on all the comments. Was worth all the work I'm sure!!!! What a great tutorial- and giveaway! LOVE this tute, I'll have to make some of these for gifts! THANKS! Nice project. Thanks for the tutorial, and the chance to win fabric. Awesome. Love this tutorial! What a great use for some of those bigger pieces in the scrap bucket! Oh, wow, this is awesome! I`m definitely sewing up a bunch of these as Christmas gifts. Wow this is really a great gift!!! This blog hop has been fantastic. My family is going to be soooo happy this Christmas. Thank you all for such fabulous ideas/tutorials. This is darling and I think I'm going to use this for MY Christmas gift to me. :) Thank you for sharing. Wow this is beautiful. I love such clean and precise piecing like this. So sad the hop is over :o( had so much fun and loved all the time everyone spent on all the great tuts. I love your idea here, may try this for my grandaughter, Thank you! Great tutorial. Thanks for sharing it! And thanks for the giveaway! That is SO cute! Bookmarked! This is such a great idea and one that not everybody will be making this year! Love the idea! Thanks. Love this! Adding the little notebook is a brilliant idea. Thanks! Sweet little gift idea! Thanks! Love it! Such a useful little organizer! I love this! I think I might have to attempt a modified version to hold my daily agenda on one side and a memo pad on the other. I've always wished I could have something to hold my "organizational necessities" all together and I think this might be perfect. Thanks! Thanks for the awesome tutorial. I have been following along with all of them... the only problem now is finding the time to do them all!!! Thanks for the fabulous tutorial - I`ll have to give this a try...oh, and thanks for the giveaway! Thanks for sharing such a great tutorial on a pocket wallet. Love that you shared what kind of interfacing you use. This will work for several folks on my Christmas list...thanks so much for posting it! I would love to try making that organizer. It is super cute! Fabulous! There are so many potential uses for this project! A fitting end to a great bloghop! this is super cute - i might need to whip one up for myself; never mind all the people i need gifts for! Thanks for the lovely gift project tutorial... and the great giveaway. this is so cute. I would love to make one for each of my daughters. Thanks for a great tutorial. I can see myself making several of these for gifts. Thanks for the great idea, tutorial, and giveaway. Great tutorial!!! And thanks for the chance at the giveaway! Thanks for the tutorial! This will be a perfect gift for a few of my girlfriends! Great job. Those clips are a great idea to hold things in place. This is the perfect gift to make for my quilting buds. Thanks so much for the pattern and the tutorial! Love this organizer! And those metro dots are one of my favorites - I have that fabric in a bunch of different colors! This is a fabulous idea! Thanks for putting a tutorial together for us. What an awesome tutorial. I love it. These would be great gifts for anyone. Thank you. I love your tutorial. I am making a bag from one of the other tutorials and this will go with it as a gift for my friend. Thanks for sharing your talent with us. Great tutorial! I've been trying to find something just like this...thanks! What a great idea! With "masculine" fabrics, this would work well for some of the guys on my list, all of whom are hard to shop and sew for. Thanks - and Merry Christmas! Thank you! I love this little wallet and know a few people who would love it as a gift too. Hi! a newcomer to your blog, I realize I must follow you! Great tutorials! Thanks for the cute tutorial. Great gift idea! Thank you for the tutorial. I'm now going to follow your blog. great toot! great to just stick it in your pocket and go. thanx for the project. Oh, I love this one! My mom hates carrying a purse and actually carries around a little Spongebob Squarepants wallet that came out of kids meal. She traded one of my sons for it because he wanted her black wallet that she had. LOL This could be the perfect replacement for that wallet because, let's face it, it's a kid meal toy. How long can it possibly last? Going to have to give this one a try. Looks perfect for running around this winter - when I have coat with a pocket and don't need a purse! Thanks!! Great idea! So many ways to use these! Such a great idea! A few of these will definitely be made for gifts this year! This is a great idea, and super cute! This tutorial is great, I can really use this. Thanks so much. Love this! It will definitely be on my list to make! Thanks!! What a great idea! I would love to "wrap" gift cards in these! Awesome! I want to make one of these for my husband to take to work (he's a maintenance tech/welder at a factory), and he usually carries a little notepad like that to jot things down. It's so hard to find things to sew for men, but this is perfect! Thanks for the giveaway, too! very cool! i'm going to make one for myself first then give this out as gifts. thanks for the tutorial. want to thank you for this tutorial, very well done!